USS Becuna, launched in January 1944, is a Baloa class Submarine which served during World War II and is credited with having sunk two Japanese tankers. It was decommissioned at the end of 1969. Becuna was placed on permanent display at the Philadelphia Independence Seaport Museum in 1976, alongside the 19h Century cruiser, USS Olympia (right). 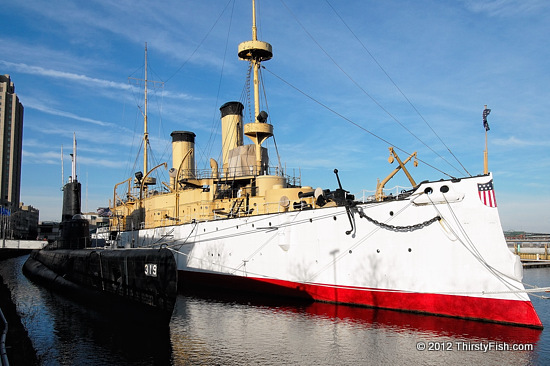 USS Olympia was the flagship at the Battle of Manila Bay during the Spanish-American War. The Spanish-American War of 1898, marked the American shift towards imperialism. After the war, the Congress was divided between "imperialists" and "anti-imperialists". Imperialists argued the economic advantages of the annexation of acquired territories and stressed America's moral obligation to civilize the world - as all imperialist have done throughout history. Anti-imperialists argued that acquiring new territories meant acquiring new problems and hurting the helpless inhabitants. The Spanish-American War is also often referred to as the first "media war". Joseph Pulitzer and William Randolph Hearst, the two prominent newspaper owners of the time, engaged in yellow journalism, using melodrama, romance, and hyperbole to sell millions of newspapers. They had a role in altering public opinion about "intervention" in Cuba by presenting sensationalist stories or exaggerations of the terrible conditions there. Although most of my journalist friends would disagree, yellow journalism continues to dominate the news today, albeit in more subtle ways.